There are young prodigies I run into every once in awhile. 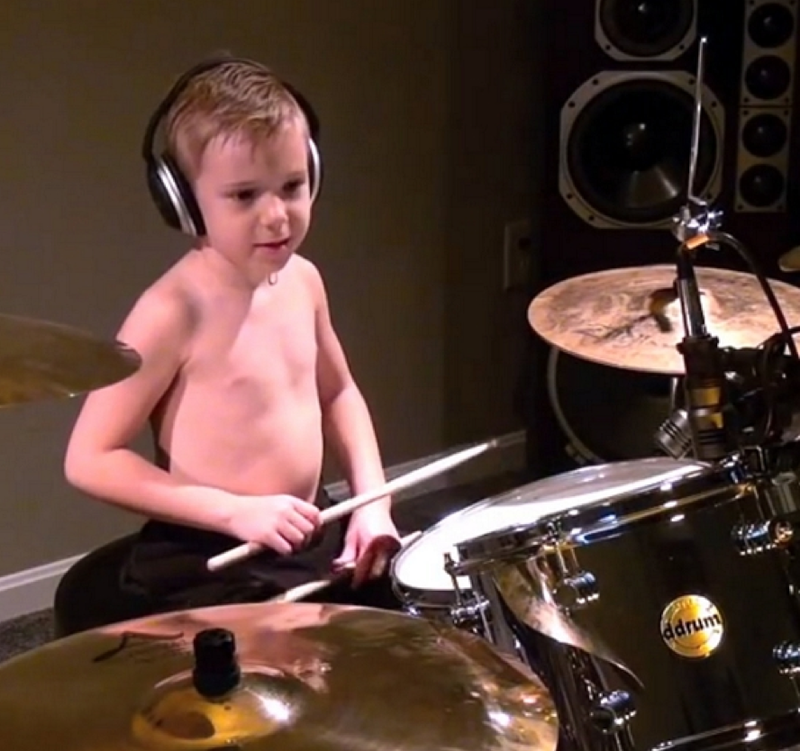 This 7 year old boy Avery Molek is just that. He's a drummer. Wow can he hang with the big drummers! Avery lives in a small town outside Pittsburgh, Pennsylvania. He was born on September 11th 2006. His dad played a little guitar, other than that his parents have no musical background. They love Rock ‘n’ Roll. Avery was always surrounded by music. Santa brought Avery one toy guitar, and one tiny drum set when he was 2. He watched music videos instead of cartoons, and wanted his mom dress him up and paint his face like the band members of Kiss. In the summer of 2012, when Avery was five, a local company asked Avery to perform a set at “Rock the Rock”, a benefit concert they were hosting. Avery nailed his performances. His cover of Van Halen’s “Hot for Teacher” went viral. The phone started ringing and hundreds of emails poured in daily including numerous requests for interviews and appearances from national television shows. With their son’s young age in mind and his well-being as their top priority, Avery’s parents decline all requests…except one. That request came from ABC’s Good Morning America who had featured Avery’s video on their show on a day when country music mega-star, Brad Paisley, was a guest. Mr. Paisley was so impressed with what he witnessed on that video that he encouraged GMA to invite Avery on the show the following week to play with him live. Avery LOVES drumming at home, but prefers being on stage with the “Grown-ups”. Crazy Train with Code Whiskey - Back when Avery was only 5. Such an incredible talent at a young age! He didn't need the best electronic drum set or the most expensive guitar, just a huge amount of passion. It will be exciting to see where Avery Molek ends up! Check out Avery's website here. Do you believe that some people were just born to do certain things? Wow. he is great! My oldest took drum lessons for years, but gave it up for karate. No, I don't believe people are born to do certain things but I do believe that people can develop a passion and drive at an early age... and wee Avery has definitely done so. Strange how some kids just seem to be born with innate abilities. He certainly has a lot of talent. I won't be surprised to see him headlining a big tour in the future! I'm sitting here with my mouth wide open and in awe of this child. I can not believe what a talent he is already. Incredible! Wow.. he is really good for as young as he is.